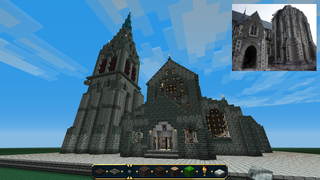 When game developer Chris Yee heard that Christchurch Cathedral was set to be demolished, he decided to rebuild it. In a video game. Now, I'm not the first to actually try this. A team of NZ Minecraft enthusiasts did this about 11 months ago, the only difference it seems is that they did theirs entirely in survival mode. That means they had to make their materials. They took about 48 hours to finish and raised $1600 for the Earthquake Appeal, so props to them ^_^. Here's the site if you're interested to see their build.